The Oil cooler is about 2 yrs. old., but due to my salt water boat being out of commission most of that time, it has less than 15 hours on it since new. Oil cooler on other engine, plus two trans coolers, which were all installed at same time, look fine. This wasn't anything like this less than a month ago. It happened in like two weeks, right after I replaced that oversized clamp below it (it had broken off). Last edited by RufusNapkin; 03-08-2019 at 09:13 PM. Looks more like corrosion from a leak to me. keysdiver and RufusNapkin like this. Drown it with WD 40 when you finished !it stops corrosion !! tunnies giving you BAD advice. Never put a lubricant between a hose and fitting that is held on with hose claps. That is corrosion not electrolysis. The green is a reaction, needs to be wire brushed, painted, and reassembled. Looks like a leak of some sort. 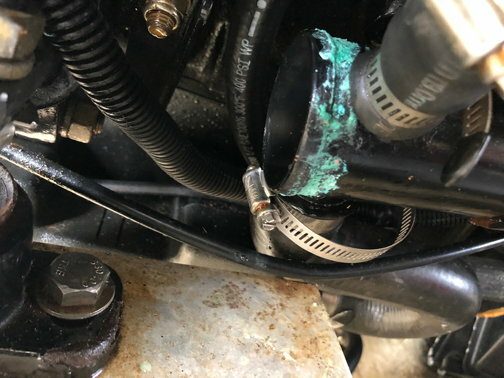 Never, ever use a oil based product on a hose connection. You can spray down most of the engine (not belts) with a anti corrosion spray. Electrolysis would have pitting as well. If you read he said after you have repaired. WD40 is just fine on motors. I've been doing it for over 30 years with good results. Only thing I avoid spraying down are the belt.